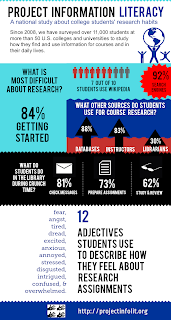 What's most difficult about doing research? and check out the 12 adjectives students use to describe how they feel about research assignments! For more, check out the Project Info. Literacy website, where you can read an article from College & Research Libraries about Alison Head's research, watch a video, and more!